The Encyclopædia Britannica Eleventh Edition [1910–1911] provides a very intriguing summary of the raised beaches that had been discovered in Greenland. These discoveries enabled the Encyclopædia Britannica to conclude that “the whole of this large island has been raised, or the sea has sunk, in post-glacial times” and that “the upheaval has been greater in the north”. Numerous raised beaches and terraces, containing shells of marine mollusca, &c., occur along the whole coast of Greenland, and indicate that the whole of this large island has been raised, or the sea has sunk, in post-glacial times, after the inland ice covered its now ice-bare outskirts. In the north along the shores of Smith Sound these traces of the gradual upheaval of the land, or sinking of the sea, are very marked; but they are also very distinct in the south, although not found so high above sea-level, which seems to show that the upheaval has been greater in the north. Ilivertalik (63° 14′ N.), north of Fiskernaes, the highest terrace is about 325 ft. above the sea. 22 Meddelelser om Grönland, part viii. pp. 203-270 (Copenhagen, 1889). 23 Ibid. part iv. p. 230 (Copenhagen, 1883); see also part xiv. pp. 317 et seq., 323. 24 Ibid. part xiv. p. 323 (Copenhagen, 1898). 25 Ibid. part ii. pp. 181-188 (Copenhagen, 1881). 26 Ibid. part i. pp. 99-101 (Copenhagen, 1879). 27 Ibid. part ii. p. 39 (Copenhagen, 1881); part xvi. pp. 150-154 (1896). 28 Ibid., part xix. p. 175 (1896). 29 Ibid. part i. p. 34; part ii. p. 40; part xiv. pp. 343-347; part iv. p. 237; part viii. p. 26. Plotting the height [converted to metres] of the Greenland West Coast raised beaches [that are deemed to be of “marine origin”] clearly illustrates the points made by the Encyclopædia Britannica early in the 20th century. 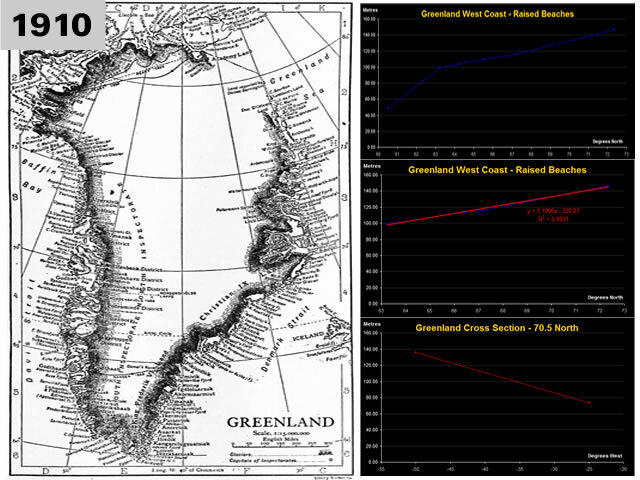 Furthermore, the plot clearly indicates that Greenland has tilted fairly uniformly [over a distance of about 1,000 kilometres] between 63º 14’ N and 72° 20’ N.
The linear trend line strongly suggests that bedrock is very inflexible [it is far more likely to fracture than bend – just like surface rocks] and that the bedrock of Greenland is fractured at some point [or points] between 60º N and 63º 14’ N.
The South-to-North orientation of the recently discovered “mega-canyon” in Greenland becomes understandable when it is understood that the tilting upwards of the Greenland bedrock has been “greater in the north”. Furthermore, the canyon orientation suggests that the rigid tilting of the Greenland bedrock probably extends for another 850 kilometres [at least] up to 80° N.
The canyon has the characteristics of a winding river channel and is at least 460 miles (750 kilometers) long, making it longer than the Grand Canyon. In some places, it is as deep as 2,600 feet (800 meters), on scale with segments of the Grand Canyon. “One might assume that the landscape of the Earth has been fully explored and mapped,” said Jonathan Bamber, professor of physical geography at the University of Bristol in the United Kingdom, and lead author of the study. Comparing the west coast linear trend line with data from the Relative sea-level changes, Schuchert Dal, East Greenland study indicates that the uplifted bedrock of Greenland has [almost] been uniformly uplifted on the East and West coasts. Widespread raised marine deposits extend to as much as 135 m elevation in Schuchert Dal. The conclusion drawn by the Encyclopædia Britannica [in 1910] that the raising of the beaches in Greenland occurred “in post-glacial times” was confirmed in 1999 by the radiocarbon dating of debris from a raised beach in Eastern North Greenland. If the modern mainstream perspective on Post-Glacial Sea Level Rise is credible then the raised beaches of Greenland were raised through [about] 130 metres in synch with sea level during the period 20,000 to 8,000 years ago and then continued to rise by [up to] 146 metres during the following 8,000 years. This figure shows sea level rise since the end of the last glacial episode based on data from Fleming et al. 1998, Fleming 2000, & Milne et al. 2005. These papers collected data from various reports and adjusted them for subsequent vertical geologic motions, primarily those associated with post-glacial continental and hydroisostatic rebound. The lowest point of sea level during the last glaciation is not well constrained by observations (shown here as a dashed curve), but is generally argued to be approximately 130 +/- 10 m below present sea level and to have occurred at approximately 22 +/- 3 thousand years ago. The time of lowest sea level is more or less equivalent to the last glacial maximum. Prior to this time, ice sheets were still increasing in size so that sea level was decreasing almost continuously over a period of approximately 100,000 years. Obviously, accounting for a potential 276 metre rise in the Greenland bedrock has presented the mainstream with a major problem that even creative accounting has failed to resolve. The gravitational attraction of the massive Quaternary ice sheets caused the oceans to rise locally relative to the land. As the ice sheets melted and lost mass, the sea level fell in response to the reduced gravitational attraction. This gravitational effect alone could cause raised beaches to occur 85 m above present sea level in Hudson Bay, and it may be the cause of the apparently rapid rate of initial emergence reported in Greenland. 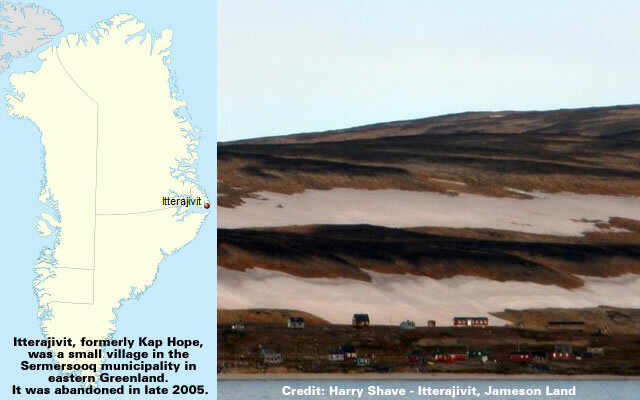 If the immediate elastic uplift of the ground is considered, as well as direct gravitational attraction of ice on water, then, of the 135 m of uplift in West Greenland, 54 m may be due to these instantaneous effects. Therefore, the rigidity of the crust and viscosity of the upper mantle beneath Greenland may not be as different from the Earth structure beneath arctic Canada as was previously thought. Therefore, it is unsurprising that academic amnesia and mainstream myopia have caused the raised beaches of Greenland to become unfashionable in the 21st century. The weight of the ice has depressed the central area of Greenland; the bedrock surface is near sea level over most of the interior of Greenland, but mountains occur around the periphery, confining the sheet along its margins. If the ice disappeared, Greenland would most probably appear as an archipelago, at least until isostasy lifted the land surface above sea level once again. The surface and bottom topography of the central Greenland ice sheet was determined from airborne ice-radar soundings over a 180 km by 180 km grid centered on the 1974 “Summit” site (lat. 72° 18′ N ., long. 37° 55′ W.) , using the Technical University of Denmark 60 MHz ice radar. Over 6100 km of high- quality radar data were obtained, covering over 99% of the grid, along lines spaced 12.5 km apart in both north-south and east-west directions. Aircraft location was done with an inertial navigation system (INS) and a pressure altimeter, with control provided by periodically flying over a known point at the center of the grid. The ice radar was used to determine ice thickness; the surface topography was determined independently using height-above-terrain measurements from the aircraft’s radar altimeter. The calculated surface topography is accurate to about ±6 m, with this error arising mostly from radar-altimeter errors. The ice thickness and bottom topography are accurate to about ± 50 m, with this error dominated by the horizontal navigation uncertainties due to INS drift; this error increases to about ± 125 m in areas of rough bottom relief (about 12% of the grid). The highest point on Greenland is at lat. 72° 34′ N., long. 37° 38′ W., at an altitude of 3233 ± 6 m a.s.l. The ice surface at this point divides into three sectors, one facing north, one east-south-east, and one west-south-west, with each having a roughly uniform slope. The ice divide between the last two sectors is a well-defined ridge running almost due south. The ice is about 3025 m thick at the summit. Excluding the mountainous north-east corner of the grid, where the ice locally reaches a thickness of about 3470 m and the bed dips to about 370 m below sea-level, the maximum ice thickness, approximately 3375 m, occurs about 97 km south-south-west of the summit. The average bed altitude over the entire grid is 180 m and the average ice thickness is 2975 ± 235 m.
The ice in most of the south-west quadrant of the grid is over 3200 m thick, and overlies a relatively smooth, flat basin with altitudes mostly below sea-level. There is no predominant direction to the basal topography over most of the grid; it appears to be undulating, rolling terrain with no obvious ridge/valley structure. The summit of the ice sheet is above the eastern end of a relatively large, smooth, flat plateau, about 10-15 km wide and extending about 50 km to the west. If the basal topography were the sole criterion, then a site somewhere on this plateau or in the south-west basin would be suitable for the drilling of a new deep ice core. 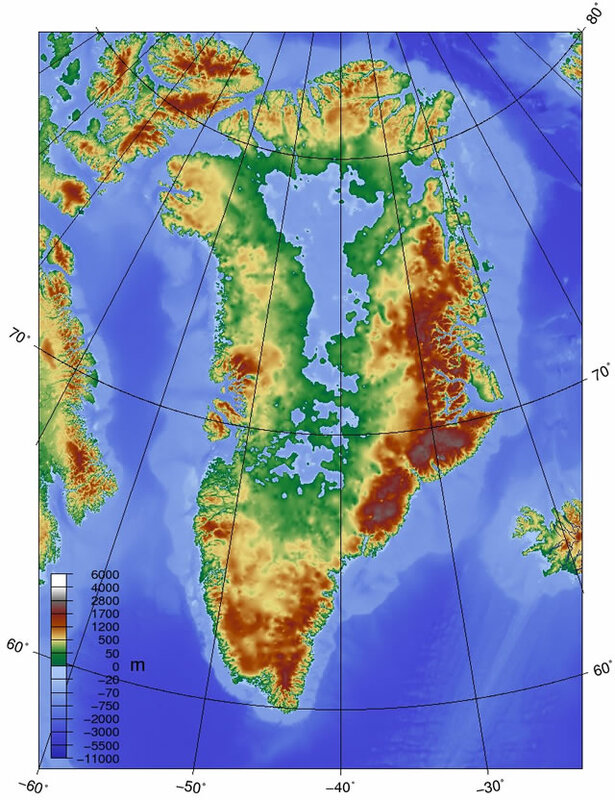 However, the mainstream Earth Sciences are particularly keen to avoid inquisitive minds pondering upon Greenland during the last ice age because a significant portion of the Greenland interior is currently [at least] 70 metres below sea level [see the topographical map above] even after the Greenland bedrock has risen by [up to] 146 metres. 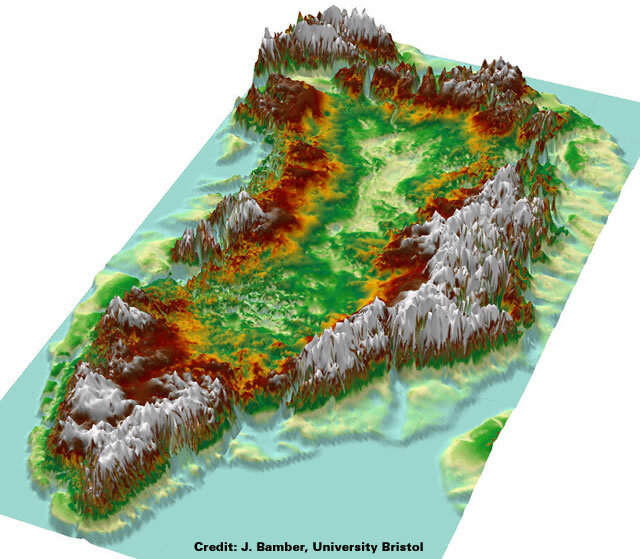 Unwinding all of the rises that have occurred in the last 20,000 years since the last glacial maximum reveals that a significant portion of the Greenland interior was, at least, 216 [70 + 146] metres below sea level. Accordingly, during the last glacial maximum Greenland was an archipelago and the current interior of Greenland would have been covered in sea ice. Later, as the bedrock of Greenland rose [after the last glacial maximum] any remaining sea ice would have become trapped in the interior basin of Greenland about 7,000 or 8,000 years ago [when the rate of change in sea level levelled off]. b) The lower portions of the Greenland ice cores are only 7,000 or 8,000 years old. c) The mainstream sea level interpretation is wrong. This is [some of] what Wikipedia has to say about raised beaches and post-glacial rebound although they prefer to use a more fashionable term: layered beach. Post-glacial rebound (sometimes called continental rebound, glacial isostasy, glacial isostatic adjustment) is the rise of land masses that were depressed by the huge weight of ice sheets during the last glacial period, through a process known as isostasy. It affects northern Europe (especially Scotland, Estonia, Fennoscandia, and northern Denmark), Siberia, Canada, the Great Lakes of Canada and the United States, the coastal region of the US state of Maine, parts of Patagonia, and Antarctica. During the last glacial period, much of northern Europe, Asia, North America, Greenland and Antarctica were covered by ice sheets. The ice was as thick as three kilometres during the last glacial maximum about 20,000 years ago. The enormous weight of this ice caused the surface of the Earth’s crust to deform and warp downward, forcing the viscoelastic mantle material to flow away from the loaded region. At the end of each glacial period when the glaciers retreated, the removal of the weight from the depressed land led to slow (and still ongoing) uplift or rebound of the land and the return flow of mantle material back under the deglaciated area. Due to the extreme viscosity of the mantle, it will take many thousands of years for the land to reach an equilibrium level. Studies have shown that the uplift has taken place in two distinct stages. The initial uplift following deglaciation was almost immediate due to the elastic response of the crust as the ice load was removed. After this elastic phase, uplift preceded by slow viscous flow so the rate of uplift decreased exponentially after that. Today, typical uplift rates are of the order of 1 cm/year or less. In northern Europe, this is clearly shown by the GPS data obtained by the BIFROST GPS network. Studies suggest that rebound will continue for about at least another 10,000 years. The total uplift from the end of deglaciation depends on the local ice load and could be several hundred metres near the centre of rebound. Recently, the term post-glacial rebound is gradually being replaced by the term glacial isostatic adjustment. This is in recognition that the response of the Earth to glacial loading and unloading is not limited to the upward rebound movement, but also involves downward land movement, horizontal crustal motion, changes in global sea levels, the Earth’s gravity field, induced earthquakes and changes in the rotational motion. An alternate term that is sometimes used is glacial isostasy, because the uplift near the centre of rebound is due to the tendency towards the restoration of isostatic equilibrium (as in the case of isostasy of mountains). Unfortunately, that term gives the wrong impression that isostatic equilibrium is somehow reached, so by appending “adjustment” at the end, the motion of restoration is emphasized. To form the ice sheets of the last Ice Age, water from the oceans evaporated, condensed as snow and was deposited as ice in high latitudes. Thus global sea level fell during glaciation. The ice sheets at the last glacial maximum were so massive that global sea level fell by about 120 metres. Thus continental shelves were exposed and many islands became connected with the continents through dry land. This was the case between the British Isles and Europe, or between Taiwan, the Indonesian islands and Asia. A sub-continent also existed between Siberia and Alaska that allowed the migration of people and animals during the last glacial maximum. During deglaciation, the melted ice water returns to the oceans, thus sea level in the ocean increases again. However, geological records of sea level changes show that the redistribution of the melted ice water is not the same everywhere in the oceans. In other words, depending upon the location, the rise in sea level at a certain site may be more than that at another site. This is due to the gravitational attraction between the mass of the melted water and the other masses, such as remaining ice sheets, glaciers, water masses and mantle rocks and the changes in centrifugal potential due to Earth’s variable rotation. 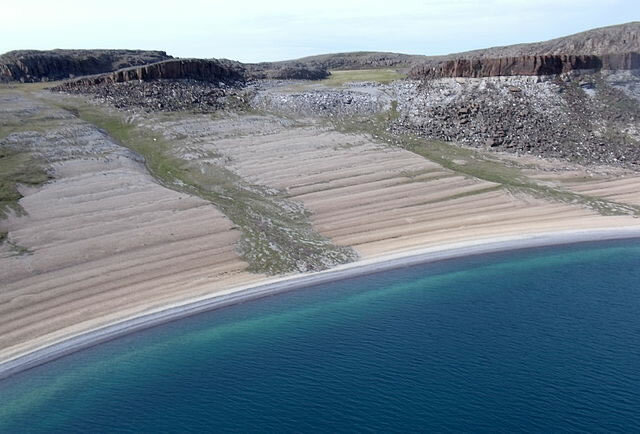 This layered beach at Bathurst Inlet, Nunavut is an example of post-glacial rebound after the last Ice Age. Little to no tide helped to form its layer-cake look. Isostatic rebound is still underway here. Seismic observations support the suggestion that the bedrock of Greenland is very inflexible. Greenland behaving like a stiff plate and it is supported by observations of aftershock in a distance up to more than 1000 km of the epicenter after a big earthquake in 1971 and one in 1965, [Gregersen, 1982a]. Gallery | This entry was posted in Earth, Geology, Greenland, Radiocarbon Dating. Bookmark the permalink. Post updated with more accurate “raised beach” information from the East coast…. Another thought-provoking analysis. Raised beaches are of particular interest in the planetary theory currently being developed by various contributors to Tallbloke’s Talkshop. If all this ice melted from the interior ice fields, how do they get the continues ice core time lines? shouldn’t there be breaks in the dates as the top layers of ice were melted? So if we remove the water in, say, the Black Sea, the Black Sea Bed it will rise to compensate???? ?